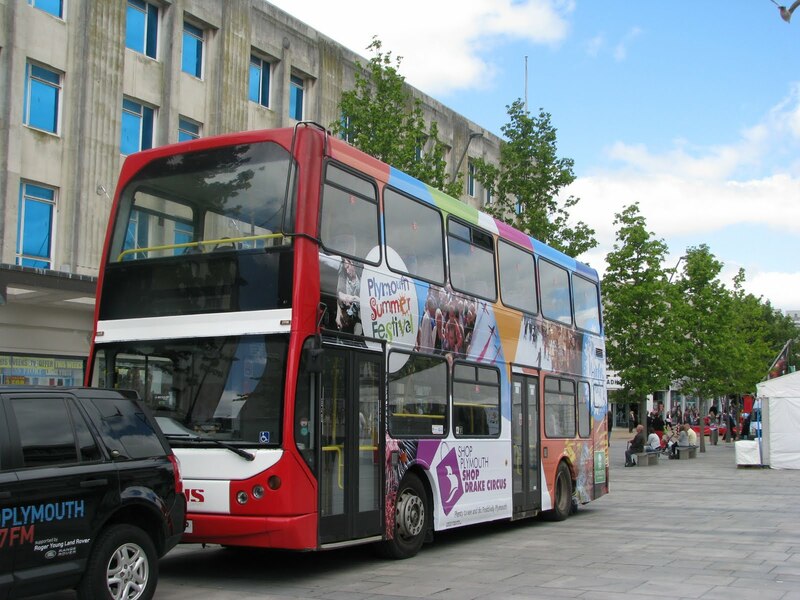 Another of Plymouth Citybus' Volvo B7s has now been branded up, with this one being put into a livery advertising the Plymouth Summer/Winter Festivals. The bus was parked next to the big screen while Radio Plymouth did some promotions along with a local band playing live music. Clever way of saving money on the re-paint though by having at least half the year covered on one bus, meaning that if and when the snow comes this winter, it won't look completely out of place! Unfortunately the Radio Plymouth car was somewhat too close to get a decent photo, and too many people were walking by to have the photo well positioned, but there we go! Well this might look like an ordinary photo of Tavylinx Volvo B6 40570, but have a closer look! Have a look at the destination. Anything odd? Apparently this B6 is going to Plymouth via 'Yey'. In fear of making myself look stupid, I have checked the timetable for the 86, and there is certainly no Yey on it! My only guess is it was supposed to read 'Mutley', but even that doesn't seem quite right! Thanks to an anonymous contributor for coming up with the answer. The photo must have been taken while the dots were flipping to change the destination, and therefore I've photographed an amalgamation of Yelverton, and Mutley! Very well done to him/her! 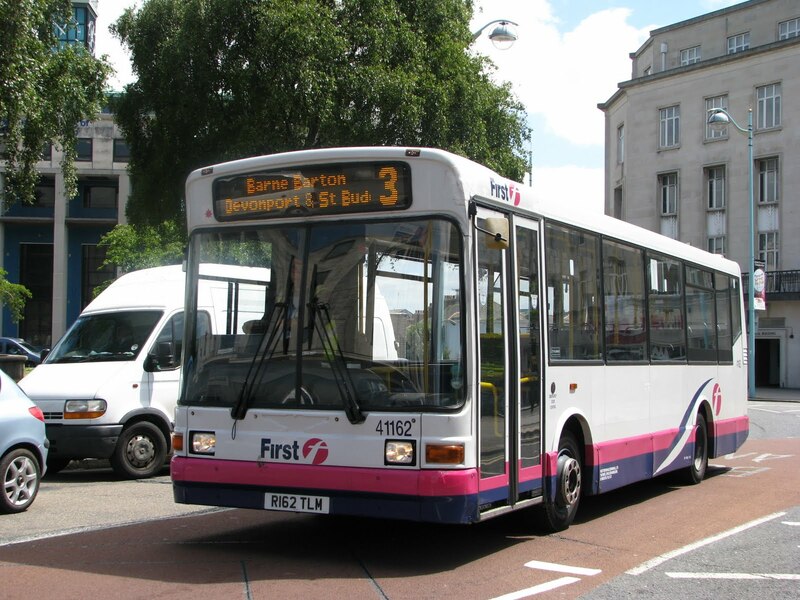 Around 4 years ago now, First's Plymouth fleet said goodbye to the last of the R-TLM batch of Marshall bodied Dennis Darts, as they headed off to to work in Swansea. Ironically, 4 years later, R162 TLM has marked the second coming of the R-TLMs with her arrival in the city. The '09' reg mini Enviro 200s are now at work in Swansea, in a new drive up there, presumably with new routes/route structure. So with these additions, the R-TLMs will be returning to Plymouth once again. 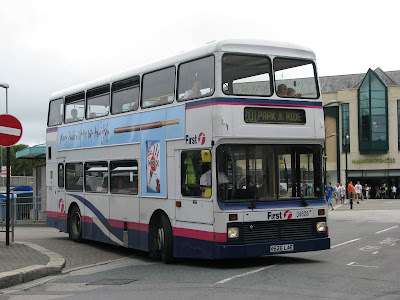 Whether R162 itself ever worked in Plymouth, I don't know, but certainly several of her sister did once work across the city, so if anyone knows if she did once work in Plymouth, do leave a comment. I must admit, after having a trip on R162, she seems in a very good state of repair. The paintwork certainly was looking very fresh, and the dark blue interior was spotless. Of course the Marshall Darts are renowned for their bumps and rattles as you drive along, and I will admit, this one does follow the trend, as well as being slightly sluggish on the hills. But yet I do prefer it to the Enviro 200s just dispatched. 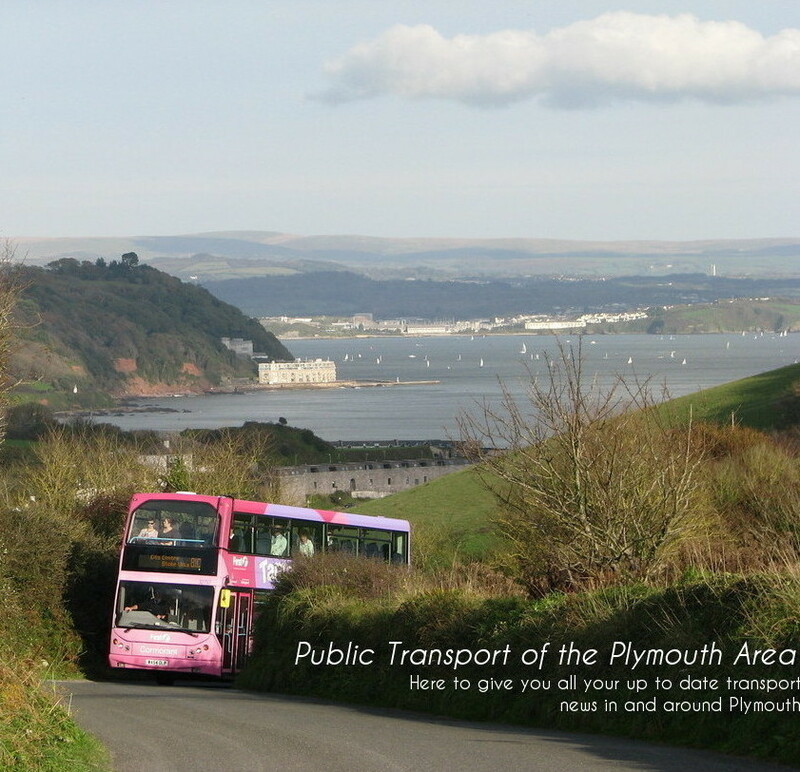 This Dart was certainly quieter, and felt much more stable than the Enviro 200s did. The very short wheelbase meant they often rocked about quite a lot, so these are certainly somewhat smoother. Wales certainly seems to have treated the Dart well though. It certainly will be nice to see a bit more variety in Plymouth over the coming weeks. The sad departure though, is that of WK56 ABZ. 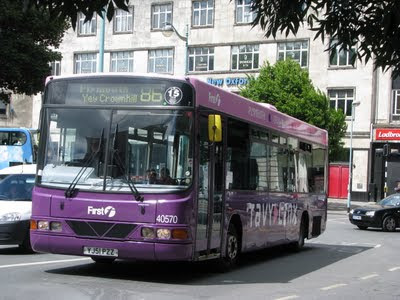 This is the Ex-Truronian example of Enviro 200 represented in Plymouth, so its a shame to see yet another truly local bus, be lost to other fleets. Of course several Ex-Truronian Darts have now made it into First Hants and Dorset. 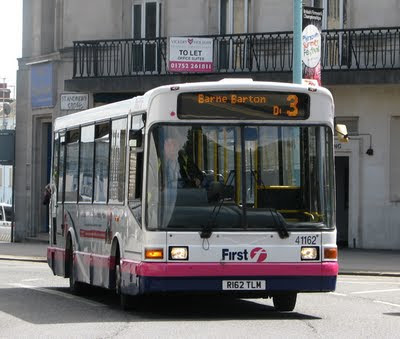 ABZ certainly felt that bit more powerful than the 09 reg Darts did, and although it did contain the backbreaking 'Urban90' seats, she always managed to give a very pleasant ride, but I suppose thats the harsh reality of being part of a nation wide group! 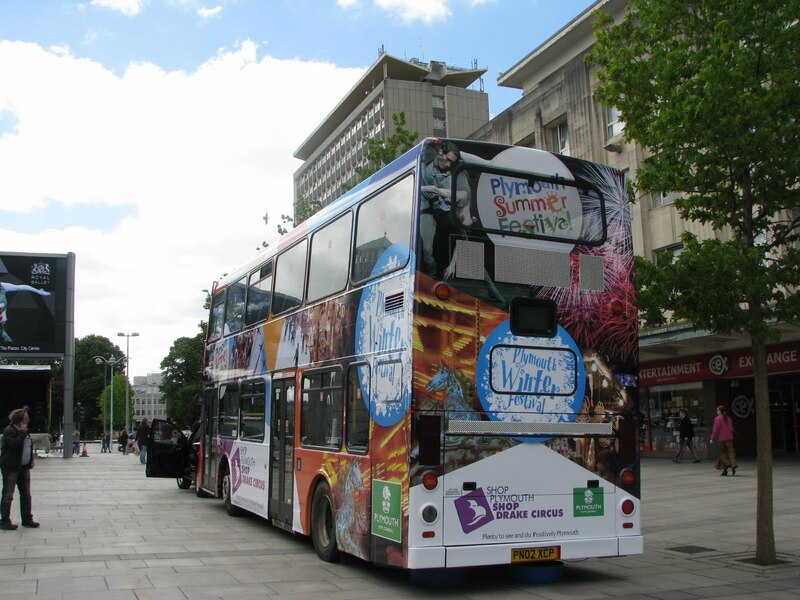 Another addition to the fleet from Taunton is S528 UAK. It seems quite strange that we have been losing our S reg Darts to FHD, but yet now we gain an S reg Dart into the fleet, which is non matching? This particular transfer just seems to make very little sense! Apologies for the quality of this photo also. Someone had decided to scratch the back window of this B6! Well we weren't far off with the prediction of K616 LAE! 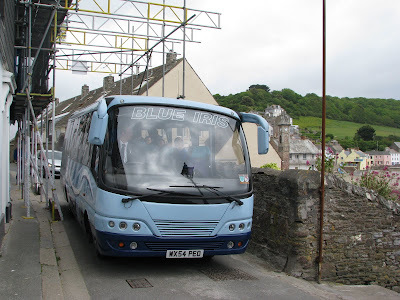 But in fact it has materialised that Leyland Olympian K626 LAE is the bus chosen to be de-roofed and be added to FDC's open top fleet currently comprising of Volvo B10M Citybus'. Thanks to thanks to 'retrobus', Anthony, K626 LAE has been spotted in Camborne, in open top format, and wearing Cornwall Explorer 300 branding, ready for the summer season. 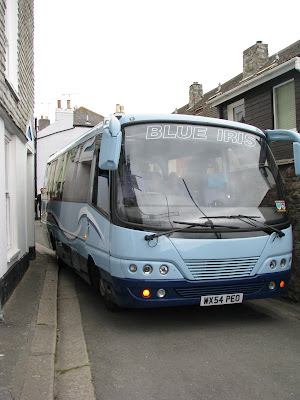 The Leylands had disappeared from the roads of Cornwall, since the introduction of further S and R reg Volvo Olympians, so its nice to see at least one return to the county. It will be interesting to see if another Leyland will receive the same treatment, as 2 are currently in use in Barnstaple, so its possible that 2 will therefore need to join the Cornish fleet to make up for the loss. I think we can presume that Barnstaple will simply use a Trident in the event of either D701 or D705 GHY not being available for service, unless we see a 3rd converted for open top duties. That's what we like to see though, a nice bit of variety! Anyway, with thanks to the keen eye of Mother PTOTPA, these photos of Blue Iris' Toyota Optimo, WX54 PEO have been captured! The bus was trying to negotiate Garrett Street in which I live in, and for people who know the area, this is simply impossible to do! Some delivery drivers are banned from using the street, such as the drivers at Tesco, so a bus of any size or shape is likely to find it impossible to get through. The driver of the Toyota did extremely well to get as far as he did, with there being several very tight turns at the bottom of the Garretts, by the post office. With the added task of getting it underneath and in between some scaffolding, the driver really did demonstrate a high level of skill. Though none more so than when he did admit defeat, and then backed all the way from just past the Congregational Church, to the village shop, right at the top of the village. The driver himself mastered this very well, but the holiday makers behind him seemed to have never realised their cars could go backwards. 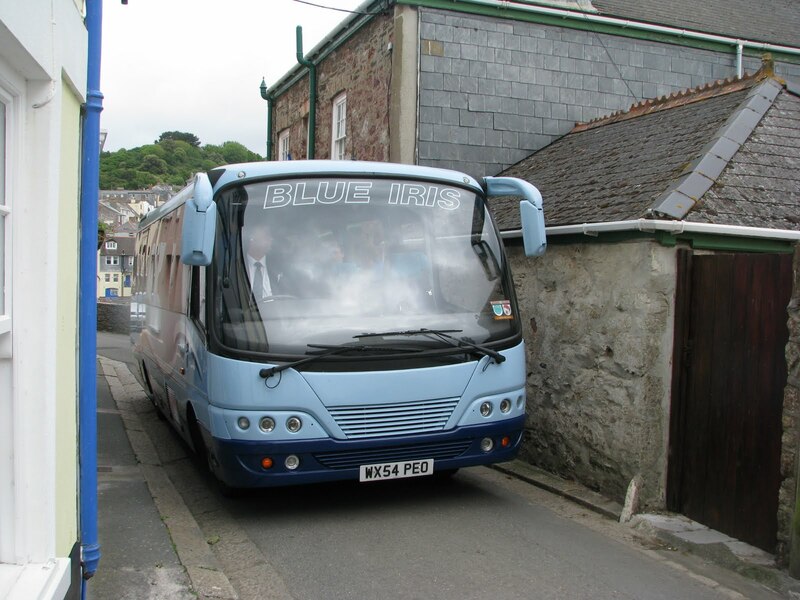 So a well done to WX54's driver, it wasn't easy getting through a very narrow Cornish village road, with some 20 teenagers on board! Everyone seemed to take the occasion in good spirit which was the main thing, and it was certainly some good entertainment for the locals! A common topic in the bus industry, is the debate on how best to produce timetables, to give clear information, while trying not to confuse the passenger. With bus stop signs I generally find that FDC's are better than Plymouth Citybus'. Though both share the same format of showing a time for every bus, along with a route, the extra bit of colour with First really adds something. 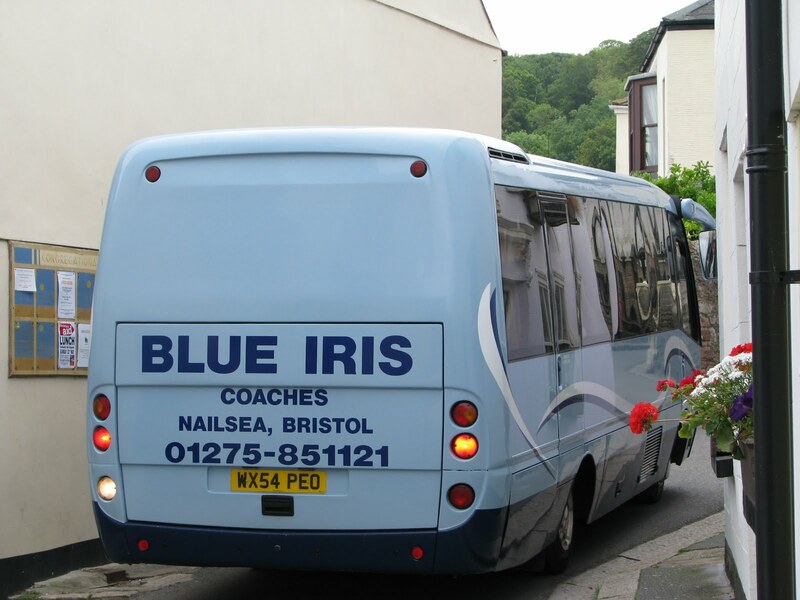 Colour coding just makes it that bit easier to distinguish between routes, so you don't get confused. First also split up their routes into a Ugo section and a standard service section, again making it easier to identify. The thing that really puts FDC's on top though, is that they DO tell you how long your journey is going to take! PCB's state an ultimate destination as well as significant points, but fail to tell you how long it will take to get to your destination. At frequent intervals? The general public who will look at the new timetables, won't necessarily know that they are now ever 7-8 minutes. This therefore really doesn't aid you in journey planning. What if I needed to get to Town for a dentist appointment from Devonport by a certain time? Its just not really very obvious. Even if it stated 'And then every 7-8 minutes' this is still somewhat vauge, as there are no previous timetables you can look back on from earlier in the day, to find the pattern. The best thing of course, would be to see it going 00, 07, 14, etc "And then at these minutes past the hour until". This is by far the best way of showing whats going on, as it shows a concise yet clear clock face pattern, and you can still work out journey times. On further investigation, even the every 10 minute routes now say at frequent intervals. Yet other services such as the 4, show "And then at these minutes past each hour". I wonder why there is a lack of continuity. You aren't exactly wasting any money, by putting a few virtual numbers on a computer screen. I'll therefore be interested to see what will now appear in the bus shelter displays. Maybe I'm just being a bit picky! Every 10 minutes is pretty much, the Holy Grail of frequency, so a route every 7-8 minutes is extremely good to see. 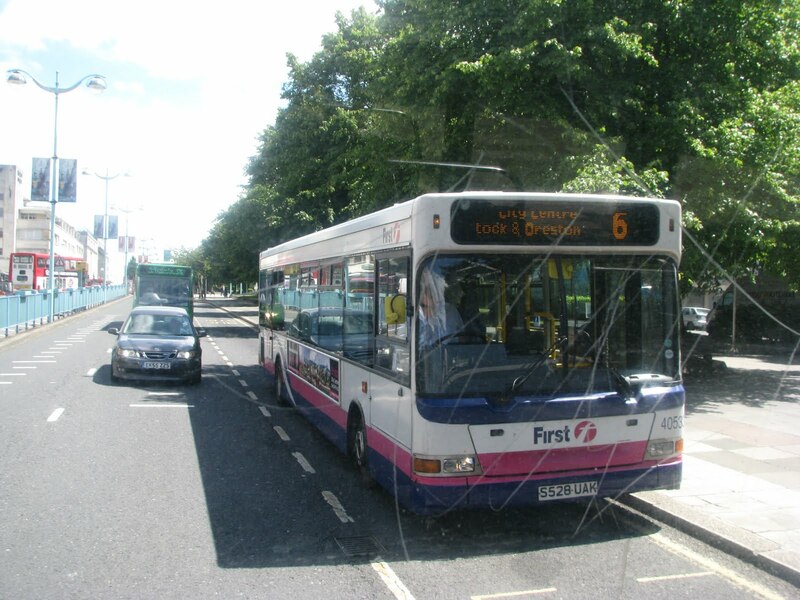 I believe therefore this is the only route in Plymouth that currently has a 7-8 minute frequency, but correct me if I'm wrong! True that some corridors are covered by multiple routes, so have a better than every 10 minute frequency, so it doesn't really cover the whole picture. The Devonport corridor is only the 3, with the hourly 81A chucked in there as well. It will be interesting to see if the 26 will see a decline in usage. At the moment, 'most' people seem to wait for a 26. But with them seeing even more 3s drive past while waiting, will more people be encouraged onto the 3? I certainly would think so. How can you ignore 2 or even 3, 3s coming past, before one 26. Interestingly, this week I haven't actually seen any Volvo B7 deckers on the 26. Is this just me not looking hard enough, or at the wrong times, or have they been displaced onto another route. I've noted N reg Darts as well as a range of standard Pointer 2 Darts, and even M129 HOD to top it off!